Principal Trumpet Cheonho Yoon has been Principal Trumpet in Berkeley Symphony Orchestra in California since 2010-11 season. 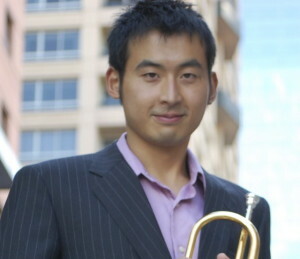 Mr. Yoon has also been 2nd/Assistant principal trumpet player of West Virginia Symphony since 2009-2010 season. He holds a Bachelor of Music Degree from Aichi Prefectural University of Arts where he studied with Yasuyuki Takeuchi. In 2008, Cheonho Yoon earned a Professional Studies diploma from Cleveland Institute of Music where he studied with Michael Sachs and Robert Sullivan and an Artist Diploma from The Colburn School Conservatory of Music in Los Angeles where he studied with James Wilt. Cheonho Yoon has played extensively with Asian and European orchestras. Before starting his orchestra career in the United States, Cheonho Yoon performed frequently with the Tokyo Symphony, Tokyo Philharmonic, and the New Japan Philharmonic. He has multiple experiences of guest playing with Helsinki Philharmonic and Malaysian Philharmonic. He has participated in many music festivals including the Asian Youth Orchestra, Pacific Music Festival, Spoleto USA, National Repartory Orchestra and has also worked extensively with Seiji Ozawa at the Ozawa Opera Festival. Cheonho Yoon is also an accomplished soloist and chamber musician. In 2005, he won the second prize in Okiden Sugar Hall competition in Okinawa, Japan. Mr. Yoon has also been chosen as one of players in Yamaha New Graduates Concert Series. He is a founding member of Lovrass brass quintet, Japan. He also has begun to explore other types of music in his own ensemble, Lamb Shank Improvisation Group of Los Angeles.